My work decided they needed to move the team to the Seattle office. So now, instead of getting to take the nice, yet snooty company bus, I have to take the public bus. The public bus involves a 10 minute walk to the stop, and about a 10 minute walk from the drop off to the office. Not a problem when the weather is nice, but this is Seattle and the weather is usually not that great. Oh, and one more thing that makes me todays douche-bag on the bus… the seating. Last time I took a public bus there was actually a little legroom on it. Now apparently the public transportation system is taking a lesson from the airlines and cramming as many seats as possible. 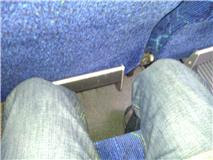 I'm not a huge guy, and if you will notice there is about an inch and half between my knees and the seat in front of me. And that front seat is all the way forward. Notice the footrest below. In order to lower it, I would have to move my legs to the side, then lower it, and use it. If there were a person in the seat next to me, I might have a closterphobic anxiety attack.